Early people thought the Earth was the center of the Universe. Nowadays, we know we live on a planet that orbits a star, and together we orbit the center of our galaxy. Our galaxy is one of many billions of galaxies in the universe. In this section, we will learn about our place in the universe, as well as properties of the Earth that pertain to the Sun-Earth-Moon system, such as phases of the moon, eclipses and seasons. In the early days of astronomy, people thought that the Earth was the center of the universe. It was believed that the sun, moon and stars orbited Earth. This is understandable, since it looks that way to us. We even still say that the sun rises in the morning, even though we now know that the apparent motion of the sun through the day is due to the rotation of the Earth on its axis. The rise of scientific knowledge has come about because of the tireless, painstaking work of very many people, adhering to the scientific method. Although there is not really one form of the scientific method, it is generally recognized that this method entails the connection between observation, theory and experimental verification. In the case of astronomy, experiments cannot be done in the same way that they are done in other fields, like chemistry for example. In a good experiment, a scientists holds all variables fixed except for one, and manipulates just that one aspect to see what effect is has on the system. We cannot do the same thing with stars and planets. We can't go to a star and change some aspect of the star and then measure the result. What we can do is gather light from the star and make measurements of the light. We can also build models of stars on computers, using the basic laws of physics. Agreement between computational modeling and observation provides us with an increasingly richer understanding of how stars, planets and the universe work. Another issue with observational astronomy is that the time frames for significant evolution in astrophysical systems can be extremely long, compared to a human lifetime. How can we hope to understand processes that take millions of years to develop? One way to answer this question would be to consider what you might think about human beings if you were only able to observe the Earth for a short time, very much shorter than a human lifespan. The fact that there are many people living on the Earth would give you a lot of information, even in a short time. You would see people of different sizes and ages, and could possibly draw conclusions about how people change as they age. Similarly, we have only a short snapshot of the stars, but there are very many stars populating our galaxy. We can infer much about the evolution of stars from our observations of large numbers of stars. As for planets, our technology has only recently advanced to the point where we can view extrasolar planets, outside our own solar system. As we learn more about other solar systems, our theories about our own solar system formation must evolve to include observations of solar systems in general. We no longer believe that Earth is the center of the universe. We now know that Earth is a planet that orbits a star, one of the roughly 200 billion stars in our galaxy. Our galaxy is one of the roughly 200 billion galaxies in our known universe. We know this because of long, time exposure photographs taken by the Hubble telescope, called deep-field images. To take images like these, the Hubble telescope was trained on a relatively empty-looking area of the night sky, taking successive observations. Please visit hubblesite.org to learn more. 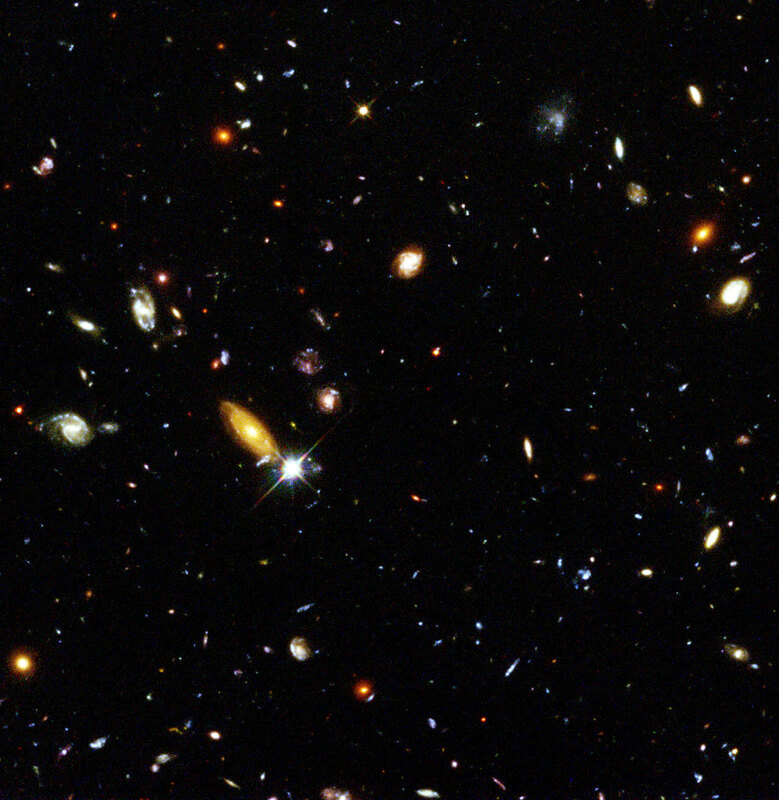 The Hubble Deep field image shows us that there are very many galaxies, some similar to our own Milky Way galaxy. Since we reside within the Milky Way, we cannot yet see how it appears from a distance. Perhaps some day we will venture outside our galaxy, but for now, our earliest probes are barely leaving our solar system. Even so, astronomers have done a lot of work to understand our galaxy and how it is laid out in space. Estimates vary between 100 billion and 200 billion as to how many stars are present in the Milky Way. The Milky Way is some 100,000 light years across. It is extremely hard for us to grasp distances that large. One way to gain an understanding of this vast distance is to compare it to sizes in our everyday lives, in decreasing scales by powers of ten. The link below takes you to one such journey, beginning with a representation of the Milky Way galaxy, decreasing to our everyday world, and continuing on down to subatomic sizes. Since ancient times, people have noticed patterns in the stars of the night sky. Stories were built up around the groupings, or constellations, that ancient folks identified. The constellations became a backdrop for the stories and lore that was passed down through the generations. Different cultures interpreted the groupings in their own ways, and named the constellations to fit their interpretations. For example, Orion the hunter is a constellation from Greek mythology, but the Sumerians named the constellation Uru An-na, and considered it to represent Gilgamesh, their equivalent of Hercules. The Chinese also regarded the constellation as a hunter, but called it Shen. Ancient Egyptians associated this constellation with Osiris, the god of rebirth and the afterlife. Copyright 2005 Pearson Prentiss-Hall Inc.
Constellations look to us to be groupings of stars, but often the stars only appear to us to be close to each other because of our viewpoint. A side view of Orion (which we can only imagine seeing) would show that some of the stars are actually very far apart from each other, and not really grouped at all. This depiction shows that some stars are a hundred light years apart. A light year is not a time a time at all; it is defined as the distance that light travels in a year. Since light travels at 300 million meters per second, a light year is about six trillion miles, or 63,000 times as far away as the sun is from earth. In astronomy, the typical distances that we talk about are so vast that we need really big units to discuss them. Following the paths of stars through the night, we see that they trace out concentric circles about the North Star. Perhaps it is no wonder that ancient people thought the Earth was the center of everything. The above image is a time-lapse photograph that shows the paths stars take over the course of a few hours. The constellations appear to move across the sky at night. Of course, it is really the result of earth’s rotation that we are noticing. Stars do move, but they are so far away that we cannot discern their motion over the course of one night. The star that happens to lie directly over the north pole seems to stand still. We call this the North Star, or Polaris. You can locate Polaris by finding the Big Dipper, and tracing a line from the front two stars to the tail of the Little Dipper. If you watch the Big Dipper over the course of a night, you will see that it rotates around Polaris. We call stars that do this “circumpolar stars.” If you look away from the north, you will see that the stars still seem to have a curved progression across the sky. There is currently no star that sits just above the south pole, but there are circumpolar stars in the southern hemisphere. Ancient people mapped the heavens and thought of the stars as residing on the surface of a great sphere surrounding the world, called the celestial sphere. We now know that stars do not all lie at the same distance from us, but the idea of the celestial sphere is still used, since it is a convenient way to describe the locations of the stars in the night sky, as viewed from earth. To learn more about the celestial sphere, please view this video tutorial (transcript), and go to the celestial sphere interactive to experiment with the software.